Traveler. Wanderer. Writer. 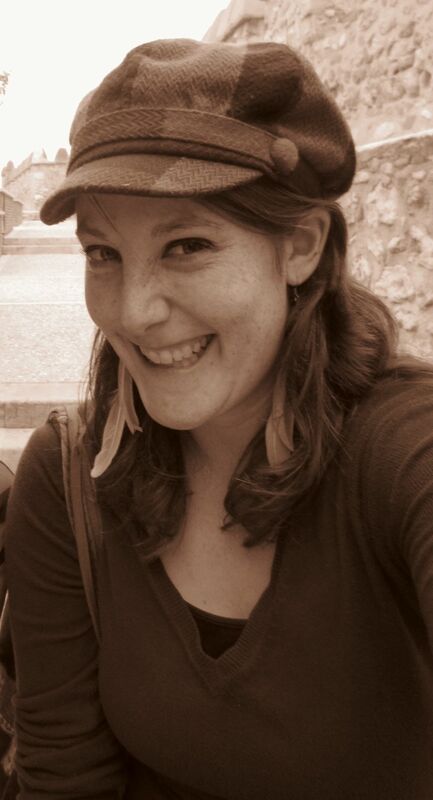 Lauren writes about life abroad, her travels, and the unexpected. Currently in the SF Bay Area figuring out her next steps. This past weekend I celebrated Thanksgiving twice. On Turkey day I went to the neighboring town of Aquadulce (Freshwater) and enjoyed a potluck feast of comida Americana y Espanola. I met other auxiliars and was surrounded by espanoles. I was a little overwhelmed by how many people were at the fiesta so naturally, I spent time with mis amigas I came with. 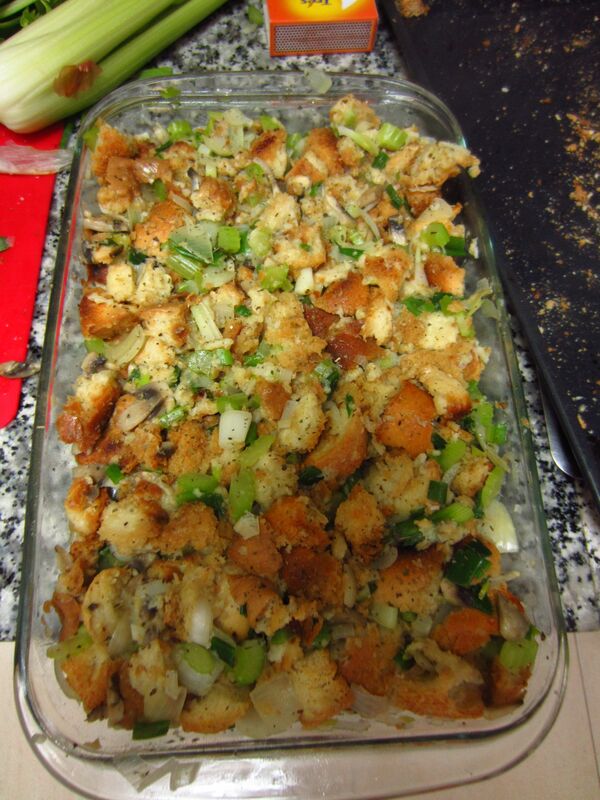 I made home made stuffing for the very first time and found it easy and fun to make and delicious to eat! My Home made stuffing! Que rico! Living abroad where they don’t have the same holidays and therefore, not the abundance of packaged goods (boxed stuffing, canned pumpkin pie, etc) requires creativity, motivation and good company to make a big feast! Thanksgiving has always been a neutral holiday for me. I like the food but it’s not my favorite. Extended family gatherings can be fun but I often feel like the black sheep in my family. 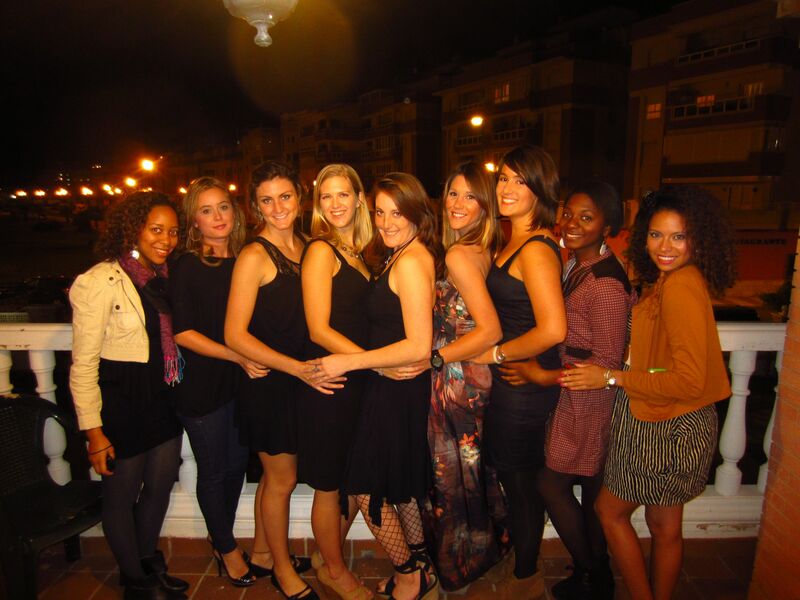 My first Thanksgiving abroad I was 19 and studying in London. 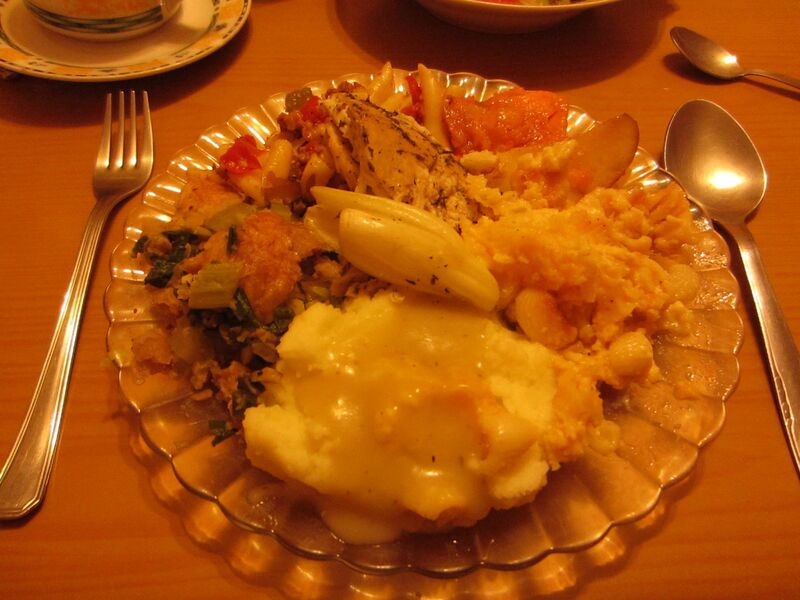 I attended a Thanksgiving feast but I remember being indifferent to the holiday while many were nostalgic and home sick. 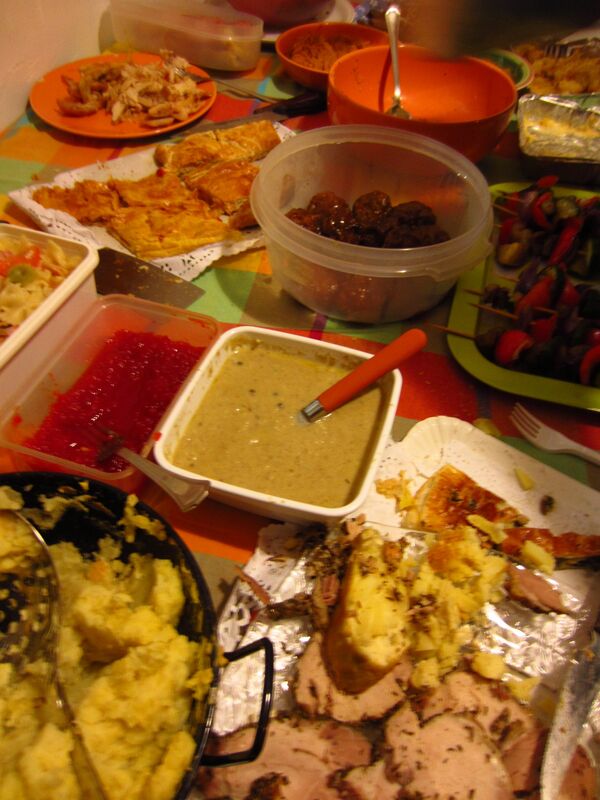 In the last 8 years, I have spent half my Thanksgivings either abroad (and didn’t celebrate it, ie- Chile 2003, Tanzania 2007,) or with my friend and her family (Oahu 2005 y 2009). Yet for the first time, I have come to appreciate what Thanksgiving is truly about- spending time with people you care about and coming together to create a meal. In Roquetas we celebrated Thanksgiving Saturday night as a familia. Un familia de Roquetas. When you’re away from home, new friends are like family. My friends were more excited to have Thanksgiving (than I was) and I was happy they were so motivated to celebrate. I don’t say no to dinner parties or food! 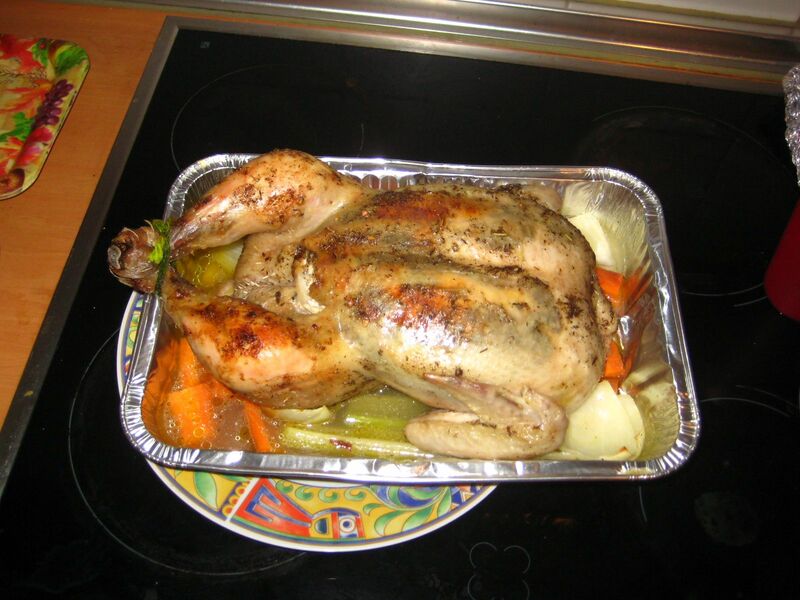 We couldn’t find Turkey (some found them in Madrid, the capital, but turkeys will be easier to find at Navidad-Christmas) so we settled for 3 chickens. Jessica had a great recipe and took a lot of care and time creating a delicious herb butter baste. Oven usage was tricky becuase we realized it wasn’t feasible to fit 2 in the oven at the same time. But we made do. We each brought a dish to share, some created their favorite recipes and some tried cooking for the first time. We all found dinner more delicious than at home because we all knew how much time and effort we put into our dinner. 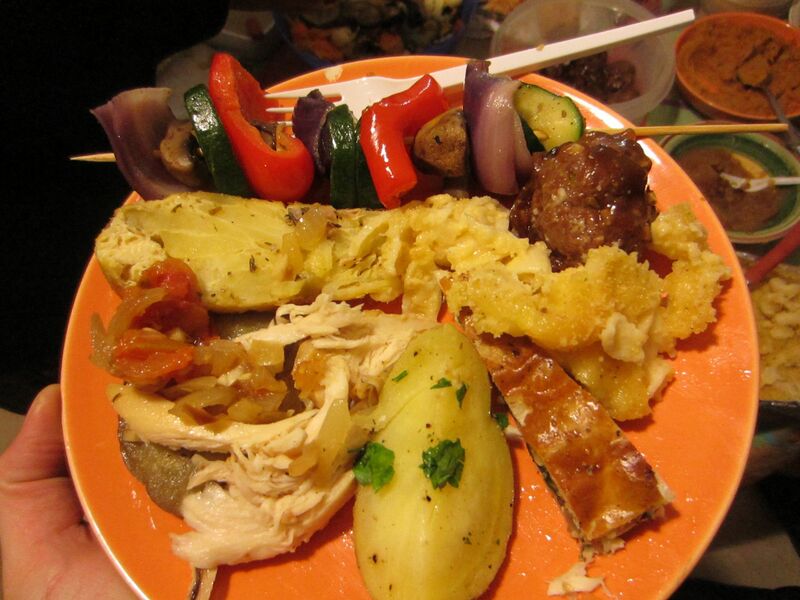 Jessica says she can’t cook but she proved herself- with her chicken, and deliciously spiced baked apples and yams. I think she surprised herself with what she is capable of. Go Jessica! Who knew they could be so good? I may need the recipe to share with my family on Christmas day! Jessica really wanted a proper sit down dinner and for each of us to share what we are thankful for, as she does with her family and despite the feeling of herding cats, she made it happen. Each of us, helped make it happen. 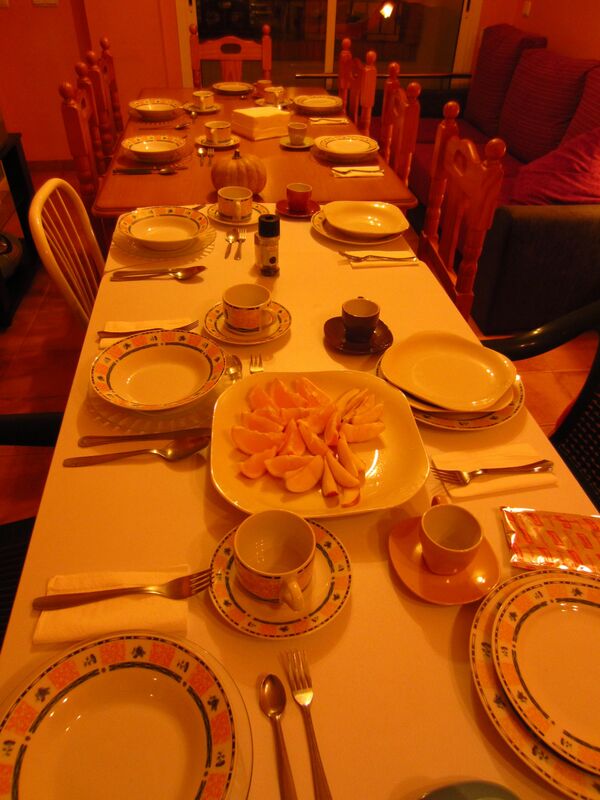 Celebrating Thanksgiving in Spain has made me Thankful for the effort that goes into preparing a big feast each year. I now understand why the mashed potatoes might be cold when we all sit down (there is not enough oven space to reheat everything once the Turkey is ready and there are to many dishes). But Thanksgiving isn’t about if the turkey is dry, if the food is cold, or if the food isn’t my favorite because Thanksgiving is about being together with people you care about! And that’s more important than anything else. 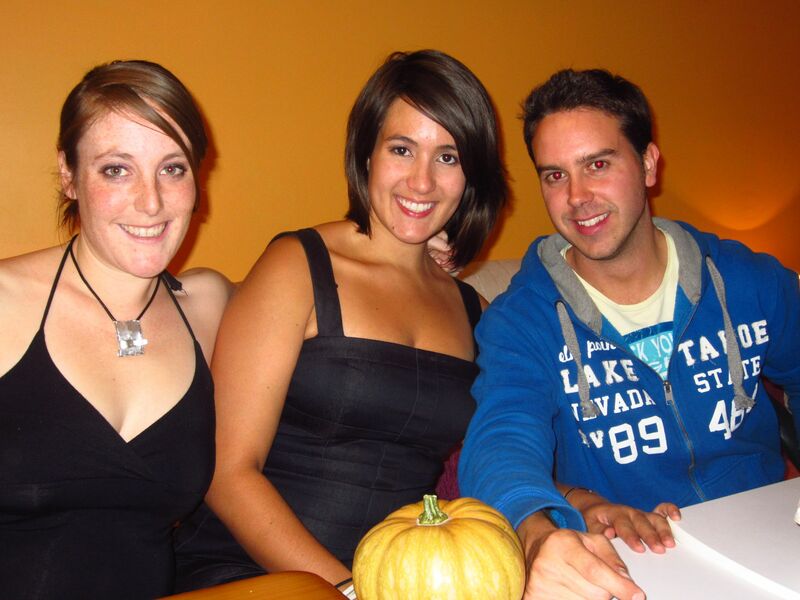 Yo, Jessica y Antonio con la calabaza (pumpkin)! 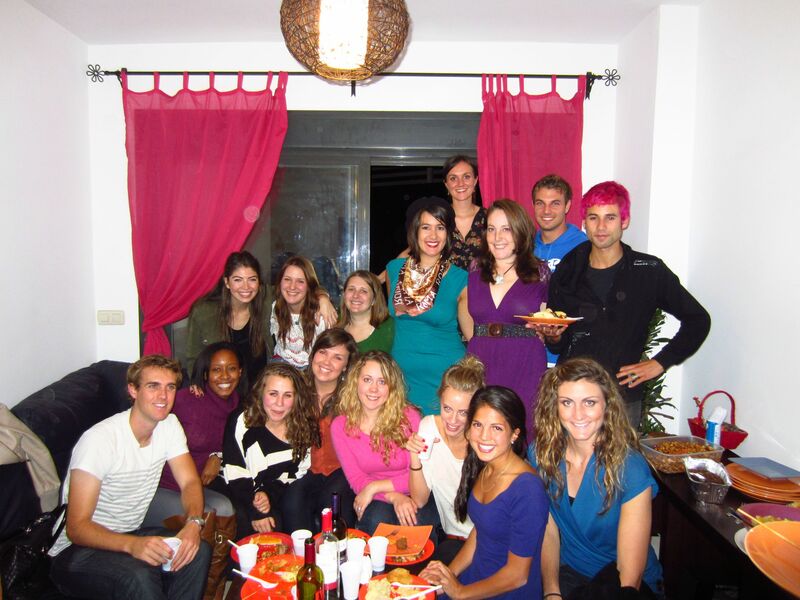 Have you celebrated Thanksgiving abroad before? Where and what was it like? 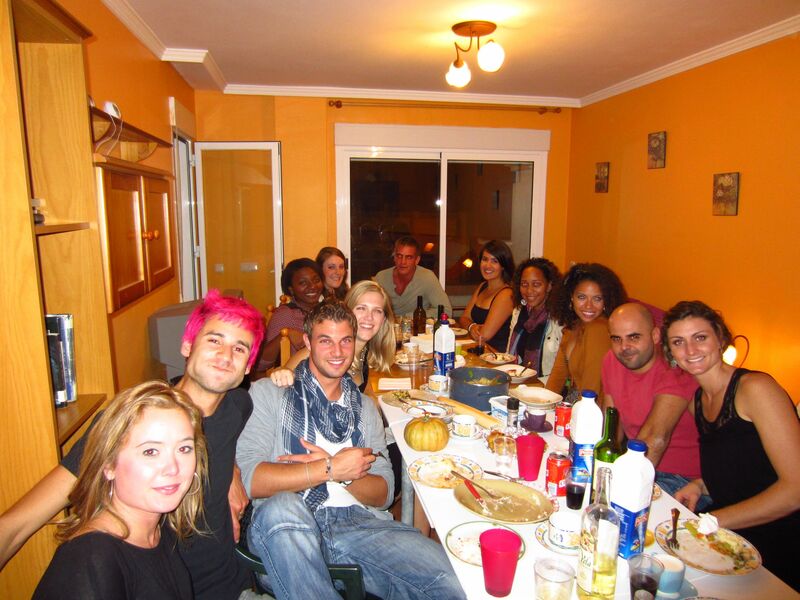 Auxiliars and expats- what are things you enjoy (ed) about celebrating Thanksgiving in Spain? Did it meet or exceed expectations? Share your stories and experiences by clicking the “comments” button on the left. A California gal fulfilling a dream to immerse herself in the language of español by living in the land of jamón and tinto de verano. A year teaching English in sunny Andalucia became another in rainy Basque Country in the North. 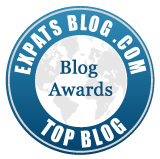 I write about my travels, food and my perspective about the unexpected. Now based in the SF Bay Area. Join me on my adventure! Enter your email address and stay up to date on my adventures! Travel buddies: Traveling with my brother!